Inbound programs that control costs and improve customer satisfaction. We design and manage programs to respond to mailings, emails and phone calls from your customers and prospects. This can include requests for product information, problem resolution or account management. Starting with our call center, we employ a rock-solid Automatic Call Distribution (ACD) and Interactive Voice Response (IVR) system. We employ the management systems and reporting you need to ensure calls are answered promptly and to any stated Service Level Agreements (SLA’s). We include integrated CRM capabilities to track individual customer responses. Our management team constantly reviews and analyses conversations to make sure our staff is responding to calls in a professional manner and to address additional training or new issues before they become a problem. Inbound and outbound call support with Automatic Call Distribution and Interactive Voice Response. CRM based system lets us capture and report call responses or issues. One click email response. Our system lets us quickly send a follow up email to a caller. Skills based routing is employed by both our email and call center inbound systems to ensure the proper CSR responds to a customer’s request. Prompts are provided to the customer and based on their selection their call or email is routed to the CSR group with the proper training to best answer the customer’s questions. Many of our clients’ support and marketing questions can be supported by our robust CRM prompting system. 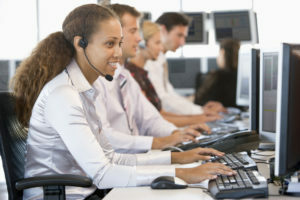 Our call system has the capability to build in multiple question and answer prompts that our CSRs can select based on their conversation with the caller. For more advanced technical issues we employ web based knowledge base systems with enhanced search and response capabilities. ACS is known for the custom reporting capabilities we provide to our customers that go beyond the canned reports typically available. Because every client’s project has its unique aspects we craft our reports around your specific needs. We know how critical it is to protect customer credit card information. Our systems and procedures are designed to be PCI compliant.